Northern white cedar is absolutely the best wood for canoe ribs and planking. Its light weight, strength, flexibility and rot resistance can not be matched by any other wood. Although Maine has vast quantities of white cedar, it is still very difficult to find, select and sort out the knot- and defect-free lumber that is required for canoe construction. 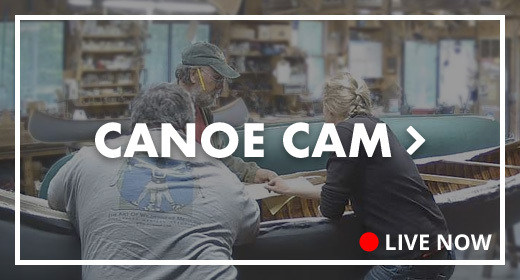 The rough stock, ribs, and planking offered by Northwoods Canoe Company are from plain-sawn lumber, which means most of the pieces will have flat grain patterns. All wood is of the best premium canoe grade. A one inch thick board is normally thick enough to produce two ribs or thee pieces of planking. The edges of lumber are rough, so to produce a 3″-wide plank, it needs to start with a 4″-wide board to smooth up the sides to the 3″. Northwoods Canoe Company has been able to obtain a treasured amount of quarter-sawn white cedar which is available ONLY as pre-cut planking, 3″ wide, 5/32″ thick, in six- to eight-foot lengths. Pre-Cut Rib Stock – 2 3/8″ wide; 5/16′ thick, 60″ long : $6 ea. Our canvas is the highest quality midwest duck. We have a variety of canvasses in different widths, weights and treatments. Mildew Resistant Canvas. Standard #10 grade, 58″ to 60″ wide, treated to resist mildew. Unlike the old lead-based canvas fillers, modern oil/silica and latex fillers do not protect the canvas from mildew and rot. Fungicides and preservatives applied separately can interfere with the application of the filler. This new type of treated canvas offers long-lasting protection from rot and will not shrink away from the rails. Untreated Canvas. The canvas that has been used traditionally on canoes. It has not been preshrunk and contains no chemicals. 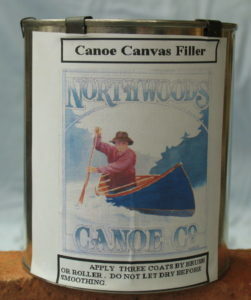 Northwoods Canoe Company offers the traditional oil-based filler. The traditional alkyd oil- and silica-based filler is mixed at the canoe shop. It is a durable filler that has proven performance on thousands of canoes. This filler needs three to six weeks for drying and creates a hard durable surface for enamel finish paint. It can be stored almost indefinitely at any temperature, but the ingredients will settle over time and must be remixed. Instructions for application are included and are also described in The Wood & Canvas Canoe. 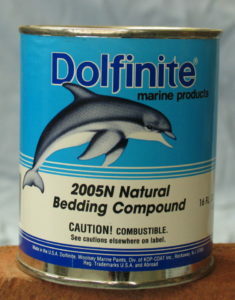 Bedding compound is applied under stem bands, keels and other wood joints. It seals joints to prevent water damage and leakage. It remains soft and flexible for many years so the joint may be taken apart later. It can not be used as a glue or body filler or for structural repairs. $20 per ½ pint, $38 per pint and $55 per quart. Git-Rot pours into the finest openings, penetrates and completely saturates rotten wood, arresting the progress of dry rot. Cures in 48 hours to a tough, resilient adhesive that bonds the wood together. The Git Rot is good for small areas such as for the tips of the decks, stems and rails that show the first stages of rot but don’t yet need to be replaced. 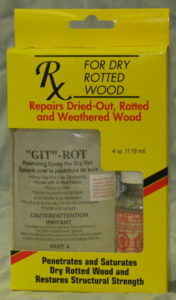 Any large areas of rot should be cut out and replaced.